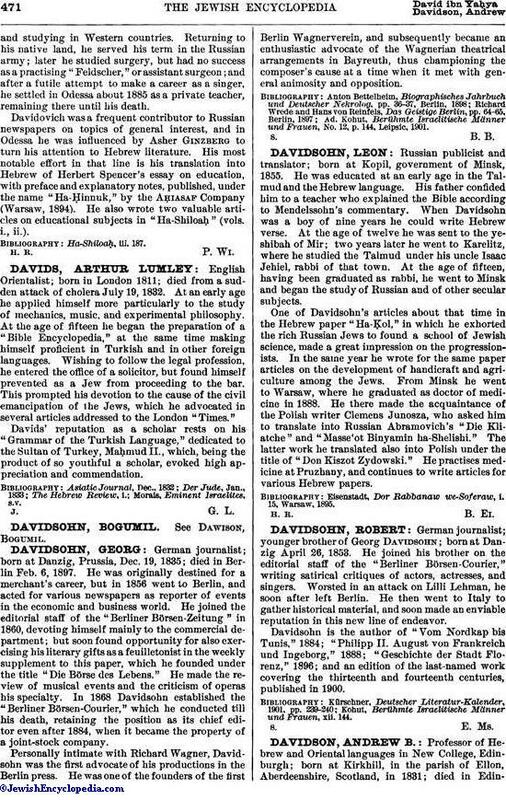 German journalist; younger brother of Georg Davidsohn; born at Danzig April 26, 1853. He joined his brother on the editorial staff of the "Berliner Börsen-Courier," writing satirical critiques of actors, actresses, and singers. Worsted in an attack on Lilli Lehman, he soon after left Berlin. He then went to Italy to gather historical material, and soon made an enviable reputation in this new line of endeavor. Davidsohn is the author of "Vom Nordkap bis Tunis," 1884; "Philipp II. August von Frankreich und Ingeborg," 1888; "Geschichte der Stadt Florenz," 1896; and an edition of the last-named work covering the thirteenth and fourteenth centuries, published in 1900. Kohut, Berühmte Israelitische Männer und Frauen, xii. 144.